Then your big moment comes: time to dance with someone… to real music. The song starts. You get a little nervous. This is all up to you. You listen carefully, desperately trying to hear that elusive 1 count. You’re not sure if you’re right but you decide to go for it. You do it, you step forward praying that your partner is going to follow the same beat as you, pleading with all the gods above that you can think of that you’ll both be in time together, wishing that this will be your moment to shine. You look around and see everyone in the club looking at you, some staring in horror, some shaking their heads in shocked disapproval, the rest laughing. Laughing so hard that your unborn children will have to go to therapy to get over it. All because you can’t find the beat. The laughing gets louder and louder and finally… you wake up screaming, breathing like you’ve just run a 100m sprint, drenched in a cold sweat. If you’re anything like me you’ve had this dream at least once (or maybe I just have issues). The truth is, when you’re starting out, finding the beat in salsa can be a bit of a nightmare. You listen to the music trying to hear that magical 1 so you can get your boogie on, but somehow it seems to elude you. Let me tell you, friend, you are not alone! For many people not exposed to salsa music from a young age, finding the appropriate beat to start on can be tough. Or at least, it can be initially. But just remember: if a bloody bearded Irishman like myself can do it, then so can you! I’ll try to keep the explanations short and sweet. It is completely unscientific and this annoys a lot of people because we would all love a more definite marker in the music. But it works. The only caveat is that you have to dance with someone who already knows how to dance well. Otherwise, it’s a true case of the blind leading the blind and you may end up with something reminiscent of my nightmare above. For those of you who aren’t content with the “wishy-washy, unscientific, New Age, hippy, natural” method above, there’s a more in-depth (read: complicated) method. In its original form, salsa’s rhythm comes from two percussion instruments: the clave and the congas. The clave is basically 2 sticks struck together in either a 2/3 or 3/2 rhythm. Clave literally translates as “key” or “code” and is the original base beat of cuban son (the precursor of salsa). The congas are the tall African-style hand drums that you may have seen if you’ve ever seen live salsa music. Congas provide the back beat to salsa music. If you can only hear the clave or the conga, you can hear the beat and dance to salsa music. In order to use these instruments to find the beat in salsa, we need to understand a little more about salsa itself. Salsa is danced to two measures of four beats each making a a total of eight beats. Of these eight beats, we normally step (or transfer weight) on only six beats (1, 2, 3… 5, 6, 7…). The 4 and the 8 beats are used for a slower weight transfer (i.e. we don’t actually step on them but can transfer our weight more slowly between each measure). 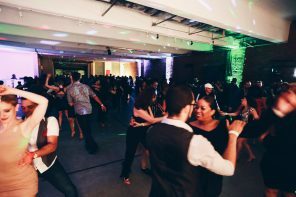 Salsa generally starts on the 1 count with the directional change (break) occurring “on 1” or “on 2” (depending on the type of salsa). Now, with this knowledge we can use the instruments to help us find the beat, i.e. to tell us when to start dancing. With the 3/2 clave rhythm, the first sound of the first three beats is the 1 count. Of course, often the clave can be difficult to hear. Find out more in Where Did The Clave Go? In my opinion, it is far easier to hear the congas in a song and the truth is we (inadvertently) wait for the congas to start before we start dancing. The basic salsa beat for congas can be seen in this video. It consists of three parts: gentle slapping with the left hand called “masacote”, a heavy slap with the right hand called “quemado”, and a hollow sounding double tap with the right hand called “abierto” (I’m sure there are terms in English for these, but my conga teacher only speaks Spanish so we’ll have to make do). It is the abierto, that double tap, that is the easiest sound to pick out in salsa music. It occurs on the 4 and 8 beats, which means you need to step immediately after it (the double tap) to hit your 1. All of this technical talk about claves and congas and beats, however, requires that you actually distinguish them from each other in the song. Salsa bands are usually huge meaning a great many instruments are used which makes picking out individual instruments tricky, especially to the untrained ear. The best homework you can do for yourself is sitting down and consciously listening to salsa music. Pop on some headphones and try to pick out the different instruments in the song. Follow them all, especially the percussion instruments; the drums, the cow bell, the congas and the clave. 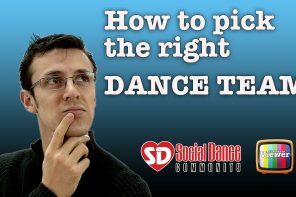 All help you to maintain your timing during a dance. If you have trouble finding the beat, then ask someone to give you a hand. As a fellow Scots-Irish Aussie, using Method One set back salsa to such an extent that bachata started to emerge. YouTube rescued me. My favorite is: ‘Understanding salsa rhythmn for absolute beginners’. Sadly, bachata has remained, and it was my fault. People also miss the fact that some of the beats of the clave are syncopated and fall in between beats. In addition there are four instruments that contribute to the beat in salsa and they will go in and out of the music during a song so you have to understand the beat patterns of each. My big success was in buying a music CD with songs having a count in them for practice. One of my favorite mistakes is to miss a four count by turning the wrong way and start dancing on the five! One of the teaching elements that makes the count difficult for students to pick up are teachers who always call the count so students don’t have to learn recognition of the music and group dancing where you can see how others are on the beat and again not learn the beat.